Last night I finished the last bits of plaster work on the Accordion Room, and today we're going to be tackling some cleanup work. My task for today is to find some kind of flat flange for the ceiling light, because we've left the ceiling paper up and it needs to be held in place at critical points. I also need to glue up the parts where the paper is falling down: in other rooms, where the ceiling paper comes down so does the plaster, and that is not what we want to deal with right now. Then Noel and I will be doing more washing of the baseboards and moldings, we'll take down the grotty roller blind, and we will break out the heat guns and paint scrapers and see how many layers of pink paint (oh, yes, there is more than one) we can get off the trim. 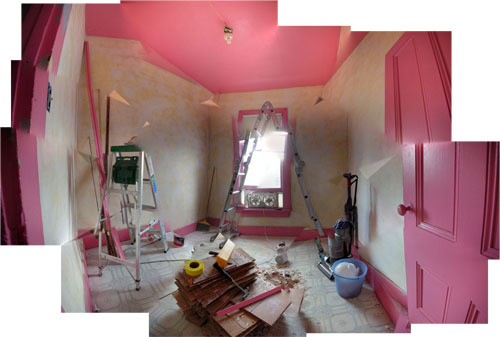 We're not looking to strip it entirely back, but the paint is bubbling off and if the trim in this room is not to be pink, we have to deal with that. It's terribly tempting to forgo other cleaning and prep activities and just prime the ceiling. Knocking back that pink would really change the room.